Richard Hines pitched well after a slow start in this April 1991 game, giving up an unearned run but not much else, according to The Greensboro News & Record. He pitched well enough to draw praise from his manager Trey Hillman, according to The News & Record. "Richard Hines started off having a little trouble locating," Hillman told The News & Record. "But I was real pleased with the way he finished up. He just needed to work down. He was rushing a little bit. It was a made-to-order game." Hines pitched that game in his second season as a pro. By the time his career finished up, he'd played eight pro seasons. He made AAA, but he never made the bigs. Hines' career began in 1990, taken by the Yankees in the 11th round of the draft out of the University of Mississippi. Hines was also credited as Rich Hines. 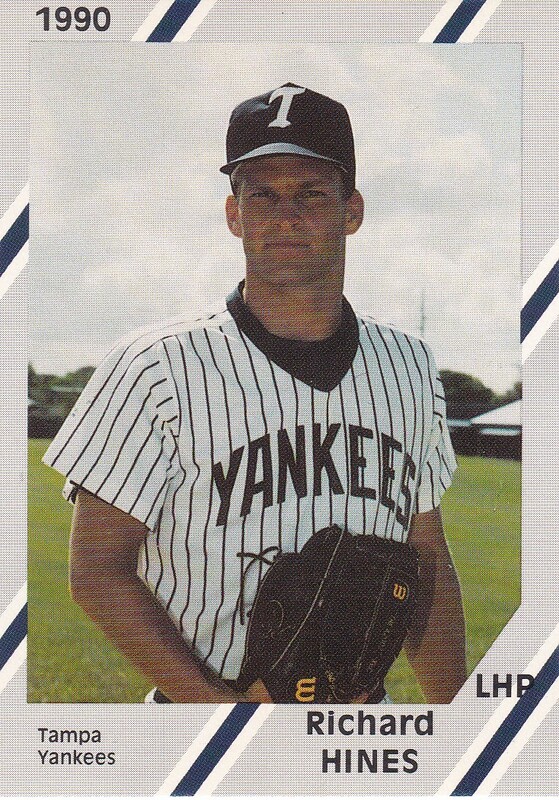 Hines started with the Yankees in the rookie Gulf Coast League. He went 5-2 over 11 outings, nine starts, with a 1.77 ERA. He moved to single-A Greensboro for 1991. He went 8-9 there in 26 starts. He ended with an ERA of 3.19. Hines made high-A Prince William in 1992 and went 11-7. He made the league all-star team, but gave up six runs in a July game. Hines moved up to AA Albany-Colonie and then AAA Columbus for 1993. In 43 relief outings at Columbus, Hines picked up two wins, four saves and an ERA of 4.02. He played 1994 completely at Columbus, then 1995 completely back at AA, then at Norwich. 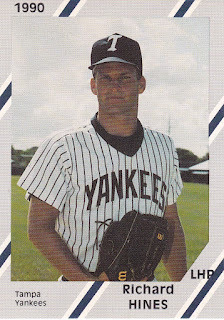 After playing 1996 in AAA at Columbus again, Hines moved to the Braves and AA Greenville for 1997. Hines won four, saved one and had a 6.58 ERA over 41 outings at Greenbille to end his career.